The School of Health Sciences, on behalf of City, University of London, welcomes Helen Gordon, Chief Executive of the Royal Society of Medicine, to City, University of London to discuss her personal career story. This marks the first of an annual Athena SWAN Lecture series dedicated to showcasing the experiences of successful and inspiring female leaders. Helen joined the Royal Society of Medicine on 1 March 2017 as Chief Executive. The Society seeks to advance health, through education and innovation via its wide range of education programmes, events and information services. Helen has a career in health care for more than 34 years. Originally training as a nurse at St Bartholomew’s Hospital, London, she progressed through a number of clinical and managerial positions in hospitals in the National Health Service rising to Executive Director of Operations /Chief Nurse at Hillingdon Hospital. In 1999, she became Chief Executive there for a year. From 2000-2005 she led Queen Mary’s Sidcup NHS Trust in South East London as their Chief Executive. She then moved from the NHS to national roles, firstly to the role of Chief Executive of the Royal College of Obstetricians and Gynaecologists (RCOG) from 2005 to 2010. The RCOG seeks to improve the standard of care delivered to women, encourage the study of obstetrics and gynaecology (O&G), and advance the science and practice of O&G. 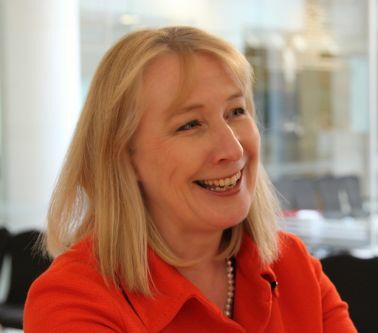 Then, from July 2010 to February 2017, she was Chief Executive of the Royal Pharmaceutical Society (RPS) where she developed the role, work and impact of the RPS as the newly dedicated professional membership body for pharmacists in Great Britain. The RPS leads the profession of pharmacy to improve the public’s health and wellbeing and is an internationally renowned publisher of medicines information. She contributed to higher education as a governor for Ravensbourne for nine years and was chair of their Audit Committee. She is the inaugural chair of the Alumni and Development Advisory Board at Henley Business School and has just joined the council of the University of Reading. Helen holds a Master’s Degree in Business Administration from Henley Business School. She was awarded an Honorary Fellowship of the Royal College of General Practitioners in November 2013 and received an Honorary Doctorate of Science from University of Reading in March 2016. Refreshments will be provided from 1.00pm. The talk will commence at 1.30pm and will be introduced by Professor Debra Salmon, Dean of the School of Health Sciences.